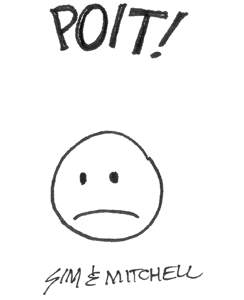 Poit is a stick figure comic drawn by Dave Sim with two scripts (La Jetee & WTF?) by Mitchell added to the art in post a la Stan Lee & Jack Kirby. The art is simple basic stick figures. The story seems to be about a guy finding his place in the world. He seems to be jumping around in time. Things become good and bad for him. A pier figures prominantly into his life. It is where he makes a fateful decision. He decides the fate of his life or death. This is another mini-mini-mini comic from Silber Media. Not sure what that is? Click HERE to for some background on these interesting little projects. Poit! is an experimental comic in more than just format. With this one BJM has asked SIM to draw a simple story, but not to explain what has happened in the story. BJM added words later, so what you have is actually (in theory) two stories, one visual, one word-based, yet both mutually compatible. It is up to the reader to draw conclusions as to what Sim’s original story was, if any, and so forth. For once I’m not going to say anything of the story because it would just out-right kill it, but I did feel that whilst being an interesting project, Poit! wasn’t so great in execution. Thankfully being the size it is, it was enough to absorb, laugh at and ponder over for a few minutes, but that’s it. With the art being so basic there was nothing visually to bring me back, and the story was simple and compact. Whilst not amazing, Sim completists will probably want it, and those of you considering buying a bundle of these mini’s may want to get hold of it for the Sim link or the experimental approach. Other than that I can’t say too much for it. Interesting but ultimately pointless. I am reviewing these together because ... well. They are like identical twins. They look very much alike, but once you get to know them, it turns out they are both psychotic. (They are also sold together.) These two mini-comics are based on a series of images drawn by Dave Sim, and presented to Brian John Mitchell, who then constructed text around the art. The art is the same between La Jetee and WTF?, but there are two versions of the text, which constitute the two versions of the comic. The art contains a recurring element of connecting failed romance with the ultra-violent Saw film franchise and thoughts of violence against the former lover, and ultimately ending in suicide. I found myself wondering what Sim was thinking when he drew this, what story he was trying to tell. Also, I wondered if he thought this was funny. Back in the day, school kids would draw pictures like these when they were mad at someone. It is funny when a third grader does it; when an adult is drawing these things, it is just kind of sad. In case you couldn't tell, the story didn't do a lot for me in either version, but I very much like the concept of the art and story being created independently of one another. Perhaps in the future there will be more Poit-like comics, with less open hostility and more fun experiments in story telling. Poit! is available in two versions titled “WTF?” and “La Jetee,” though I think they’re best read in tandem. WTF? follows a line of logic wherein depression leads to extreme outcomes, either killing yourself or killing others. Sim is able squeeze out lots of emotion from the stick figure minimalism of the art style. This version of the story seems to assert that reality is an illusion, and that there are layers of existence and subsequent comprehension on par with something like Christopher Nolan’s film Inception. If nothing else, Poit! offers an interesting experiment, as La Jetee shows us a completely different story with the exact same pictures, just different captions. This time, the protagonist seems to have some degree of self-awareness of the past life in WTF? He feels as if this current life is mis-matched to his persona. He feels like his destiny was, is, or should be different somehow. While I like this mysterious element, the ends seems to suggest that our fate is pre-determined and that free will has no bearing on the eventual outcome, despite trying to take different paths. That’s unsettling, that even taking divergent paths all ultimately leads us to the same place. This was still an interesting experiment that seems to get the most mileage out of the diminutive Silber Media size.